Peter White is in love with Alice which is why he brought her to Heartland. He wants her to love him, but she refuses to acknowledge him. He hates leaving Alice's side and becomes very jealous when Alice interacts with others like Ace and Boris. He can transform into a rabbit. Other than having a pair of white rabbit ears, wearing a watch, and wearing a suit coat he has little in common with the White Rabbit upon which he is based. He is the first to meet Alice and claims to be desperately in love with her; his sociopathic tendencies mean that he will not hesitate to kill anyone he dislikes, especially if they get between him and Alice. Alice mentions hating him on several instances, but he is persistent in gaining her love. 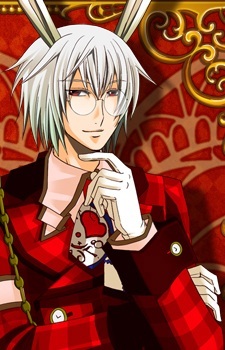 Peter is able to turn into an actual rabbit, which he does so in order to gain Alice's affections since she has a soft spot for his rabbit form, and works for the Queen of Hearts in Heart Castle as a Prime Minister. He is often caught rhyming as he speaks, however in the original version he is heard talking normally without rhyming. It appears he and Nightmare know why Alice was brought to his world and it appears he is some how connected to her older sister.